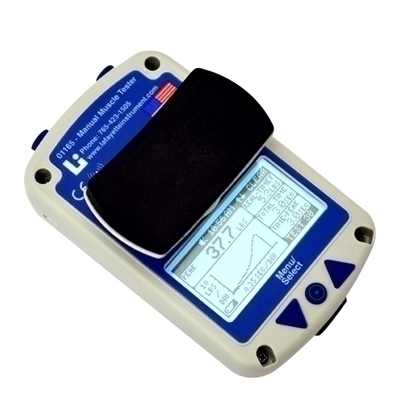 Lafayette MMT is used for measuring a wide range of strengths and detecting minor variations as well. MMT is ergonomically designed to fit therapist's hand. 9-volt battery (included). The interactive menu allows the user to select a wide range of options, such as data storage, test times (1-10 seconds), and choice of high and low threshold settings. The large, easy to read LCD screen clearly displays all information, reducing the possibility of reading errors or selecting unwanted options. 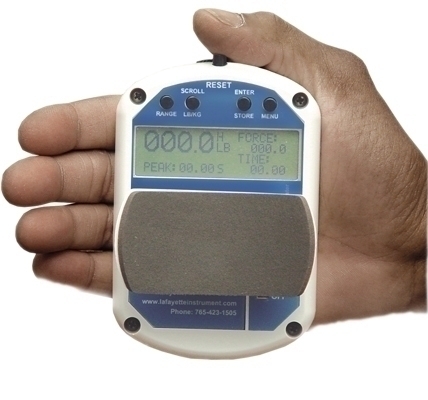 Dual measurement range (0-300 pounds or 0-50 pounds) for increased sensitivity. Storage of up to 52 test results with scroll ability. Records peak force, time to reach peak, and total time. MMT displays in pounds and kilograms. Software sold separately. Dimensions: 5" x 2" x 4"